We help them. They help us. It’s an important relationship for us both. 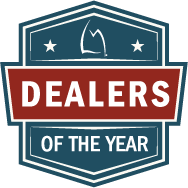 LMCU is proud to announce its annual Dealer of the Year award winners. Awards are based on loan volume, quality of transactions, accuracy of paperwork and commitment to positive representation of LMCU to the car-buying public. These exceptional dealerships consistently demonstrate and reflect our corporate philosophy of always doing what’s best for our members. Congratulations to all!